Last Saturday evening whilst in the middle of designing a new quilt (see next post) the sudden urge overcame me to make a new bag (as it does sometimes ! ). 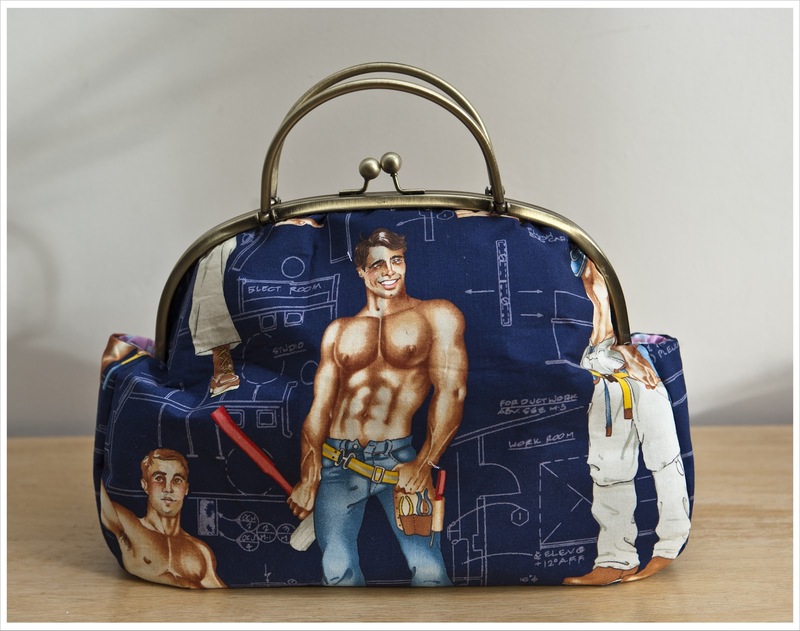 Now as you know I bought this fantastic fabric of handsome men a little while ago and was pondering what I possibly could do with them. I was thinking a pillow I could put my tired head on but I wasn't quite convinced by it. Some of you also pointed out to me that those boys are probably not interested in me (for obvious reasons), which is a real shame but they are still nice to look at ! So I thought I make them into a nice bag and I am sure the boys will enjoy to be paraded around. I had these metal purse handles from u-handbag a while and was waiting for the right moment/fabric to make a bag with them. 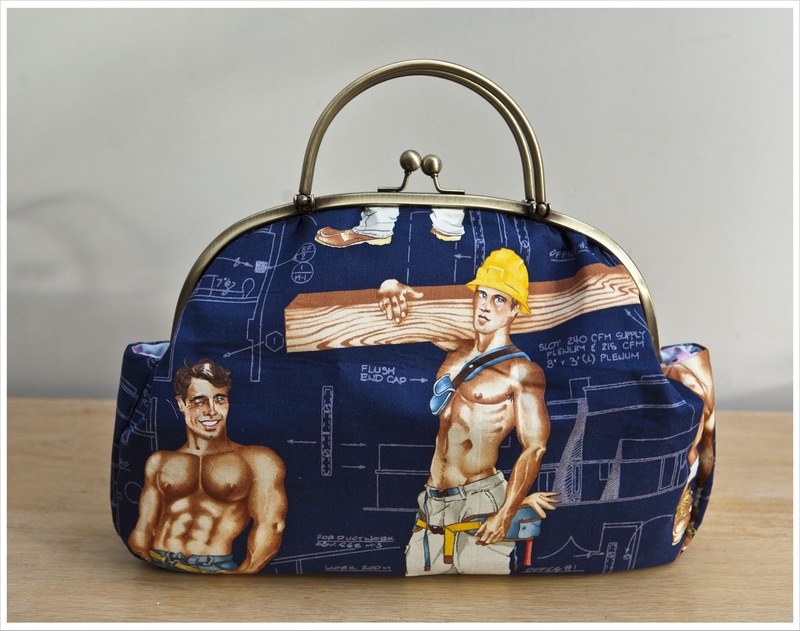 The great Lisa of u-handbag has written a fantastic book about bag making that I have in my stock, is currently writing a new one and every now and then spoils her clients with a free pattern. Before I dive into it I just want to say the pattern is very clear and easy to follow. I really enjoyed working from it. The idea was to use the fabric for the exterior and use a very contrasting fabric for the lining. Contrasting in colour and style. I spend probably longer than an hour trying to find the right fabric for the lining. I wanted something with a large pattern and something that was female, almost girly actually. And finally I found the perfect print, a Kaffe Fasset print 'Brokade Floral' that I used in one of my first quilts. Now, I never really liked this fabric as it is way to baby pink for me but it did fit well into the quilt I made at the time and I love the rose. 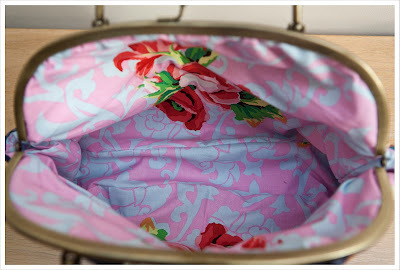 I had quite a bit left over which was lurking at the bottom of my Fassett fabric pile. So I cut the pieces for the lining exactly with the rose in the middle. That though let me to not include the elastic inner pouch for which the pattern calls as it would have hidden the roses. But I included a very small pouch on one of the gussets (you can see it if you look closely on the left) which is just big enough to hide keys. I will certainly make more bags like this and and probably include the elastic pouches but strictly speaking it isn't necessary as although the bag is of decent size it isn't deep enough to lose all your bits and bobs. And I can't tell you how insanely in love I am with it. I originally thought to put it in my online shop (the pattern allows for small sales) but I just simply can't. I love it! It works so well, and I'm loving the style of the purse clasp. Looks great. Its amazing! But will you actually carry it shopping with you? Imagine the pearl-clutching!! Completely smitten with your men! And the bag is nice too!! It's no wonder you can't "bare" to give it away! What a cute bag! I sure hope you do use it. I have this handle just waiting to be made into a graceful bag. I am inspired by your boys! The best gay bag in the world ever! Your bag is just fantastic! Hilarious! Great bag Judith, will we see that in June? !